Panama City, March 29, 2012. The National Environmental Authority of Panama (ANAM) and the Smithsonian Tropical Research Institute today presented the “Action Plan for the Conservation of Amphibians in Panama,” the first step in a series of actions to address the alarming decline of amphibians in Panama. Amphibians (frogs, toads, salamanders and caecilians) were the first vertebrates to populate the land environment. They present biological and ecological characteristics that make them extremely sensitive to changes in their environment. They are an important part of the ecological balance, as they feed on large quantities of insects and in turn are food for other animals. For this reason, they are widely used as indicators and as a warning system to alert to factors that influence health or environmental quality. In 1989, scientists sounded the alarm because amphibian populations worldwide were declining. 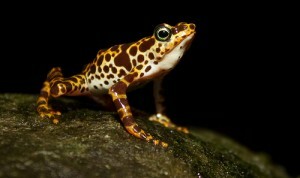 A few years later, they discovered that frogs, toads, salamanders and caecilians were disappearing due to a fungus that causes a disease known as chytridiomycosis, and that this decline in populations and disappearance of species was more evident in Panama than anywhere else in the world. It has been confirmed that in Panama this disease is responsible for the progressive and sustained decline of the greater part of the country’s frog and toad populations. According to the IUCN Red List, of the 197 species of amphibians recorded in Panama, around 25% – about 50 species – are listed as threatened. The disease has devastated frogs from the highlands of western and central Panama and is spreading eastward across the country. The speed and lethality of this fungal pathogen highlights the need to respond quickly, as scientists predict that before long the disease will spread throughout the entire country, reaching areas of high amphibian richness such as the Darien. This situation is aggravated by the imminent disappearance of species which might contain medicinal compounds (analgesics, antifungals) in their skin, or which may not yet have been described by science. For this reason, the Action Plan for the Conservation of Amphibians in Panama seeks close collaboration with various stakeholders to carry out participatory planning, integrate initiatives, optimize resources and identify potential funding sources. The Plan details specific research, conservation and education components for the short and medium term to ensure future populations. The Research component seeks to propose and promote specific actions that will generate scientific information for understanding the problem and implementing conservation strategies. The Conservation component includes the ex-situ conservation project as an immediate response to preserve in captivity those species of amphibians currently under threat in their natural habitat. Finally, the Education component seeks to implement education programs and information campaigns aimed at raising public awareness, which will in turn facilitate the implementation of conservation measures.